Straight Flutes. Straight Playing Bansuris. 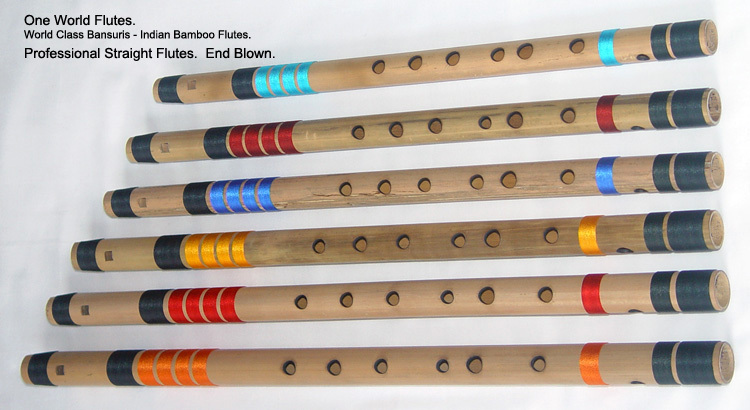 Indian Bamboo Flutes. 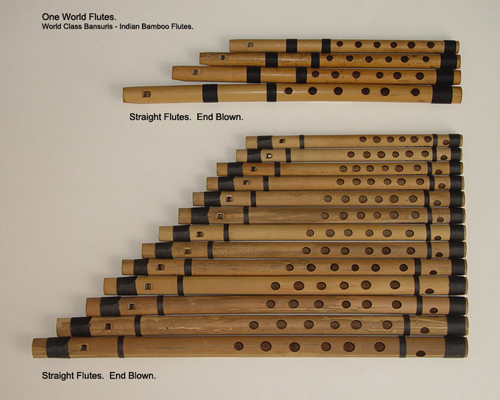 Straight Playing Flutes, easy to play and are ideal for Practice, Meditation etc. A good way to get acquainted with Bansuri Flutes. Straight Flutes ..... A = 440 Hz. Natural Note, is listed with no 'n'. Example, Straight Flute. C. G.
Sharp Note, is listed as '#'. Example, Straight Flute. C #. G #. Natural Note, is listed with 'n'. 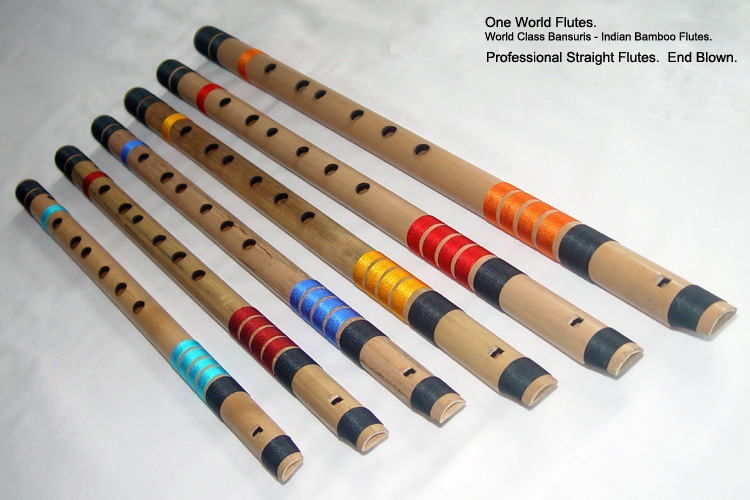 Example, Professional Straight Flute. C n.
Sharp Note, is listed as '#'. Example, Professional Straight Flute. C #. Straight Flutes, are Basic Quality Flutes. 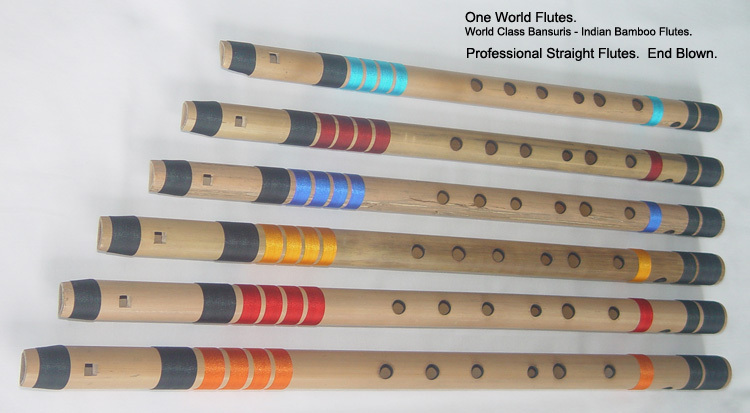 Professional Straight Flutes, are Professional Quality Flutes. Straight Flute. F #. C #. Tonic : F #. Key : C #. 13" 0.5" $12.00 F Sharp. Medium. Tonic : F. Key : C. 14" 0.6" $14.00 F Natural. Medium. Tonic : E. Key : B. 15" 0.6" $16.00 E Natural. Medium. Straight Flute. D #. A #. Tonic : D #. Key : A #. 16" 0.6" $20.00 D Sharp. Medium. Tonic : D. Key : A. 17" 0.6" $22.00 D Natural. Medium. Straight Flute. C #. G #. Tonic : C #. Key : G #. 18" 0.7" $26.00 C Sharp. Medium. Tonic : C. Key : G. 19" 0.7" $30.00 C Natural. Medium. Straight Flute. B. F #. Bass. Tonic : B. Key : F #. 21" 0.7" $40.00 B Natural. Bass. Straight Flute. A #. F. Bass. Tonic : A #. Key : F. 22" 0.8" $46.00 A Sharp. Bass. Straight Flute. A. E. Bass. Tonic : A. Key : E. 23" 0.8" $52.00 A Natural. Bass. Straight Flute. G #. D #. Bass. Tonic : G #. Key : D #. 25" 0.8" $58.00 G Sharp. Bass. Straight Flute. G. D. Bass. Tonic : G. Key : D. 26" 0.9" $64.00 G Natural. Bass. Professional Straight Flute. C n.
Tonic : C. Key : G. 19" 0.7" $60.00 C Natural. Medium. Professional Straight Flute. B n. Bass. Tonic : B. Key : F #. 21" 0.7" $70.00 B Natural. Bass. Professional Straight Flute. A #. Bass. Tonic : A #. Key : F. 22" 0.8" $80.00 A Sharp. Bass. Professional Straight Flute. A n. Bass. Tonic : A. Key : E. 23" 0.8" $90.00 A Natural. Bass. Professional Straight Flute. G #. Bass. Tonic : G #. Key : D #. 24" 0.8" $100.00 G Sharp. Bass. Professional Straight Flute. G n. Bass. Tonic : G. Key : D. 25" 0.8" $110.00 G Natural. Bass. Tonic : G. Key : D. 11" 0.5" $15.00 G Natural. Medium. Brass Flute. F #. C #. Tonic : F #. Key : C #. 12" 0.5" $15.00 F Sharp. Medium. Tonic : F. Key : C. 13" 0.5" $15.00 F Natural. Medium. Tonic : E. Key : B. 14" 0.5" $15.00 E Natural. Medium. Brass Flute. D #. A #. Tonic : D #. Key : A #. 15" 0.5" $15.00 D Sharp. Medium.